If history includes the "inventory of the differences", a comparative way of thinking has to assume a central epistemological function in a piece of historical research. Even if a historian does not plan any explicit comparison between two or more historical objects, it is inevitable that – thanks to the constructive and inductive structure of the discipline – comparative connections should be imagined as linking an object of research both with "ideal-typical" concepts and with the present. A reflexive awareness is particularly necessary in intentional comparative approaches and studies, all the more because of the decades of increasing epistemological complexity of historical research as, for instance, the centrality of theoretical categories such as transfer, entanglement and transculturality shows nowadays. The risk of a non-reflexive approach could be that of a simple association of two or more historical phenomena based on intuitively recognized similarities and differences, whose significance would ultimately remain difficult to see unless it were clearly defined conceptually. The work of Penelope Nash runs such a risk. She compares two important female rulers ("Masterful and Formidable Ladies", p. 1) between the tenth and the twelfth century: Empress Adelheid († 999) and Countess Matilda of Canossa († 1115). By means of a parallel analysis of these two women this monograph aims to illuminate the "foundations of European society" as the title announces. We might expect this comparison of central aspects of their power in chronological, geopolitical and social contexts (the Ottonian and Salian imperial rule over Germany and Italy) to allow us to check the development of social processes in two different phases of the "long" eleventh century. Nash actually wants to test the validity of a paradigm: "The eleventh century saw the rise of a more organized and centralized society in western Europe where the secular and ecclesiastical governance functions were beginning to separate from each other, the results of which in general advantaged men but disadvantaged women" (p. 10). Notwithstanding the author’s familiarity with recent studies – among others, Janet Nelson and Thomas Bisson as well as Chris Wickham –, the interpretative approaches of Richard Southern, David Herlihy, Georges Duby and Carl Leyser regarding the "changes in the eleventh century" (p. 6) seem to have had a decisive influence on her definition of this paradigm. Their classic studies can perhaps still offer a first impulse to new special studies, but they are partially obsolete and need to be complexified. In order to show "whether the two women under examination were severely constrained by the restrictions imposed on them by their society in different ways or whether they operated in much the same way because women just continued on as before" (p. 11) Nash investigates three central aspects of power in aristocratic society: kin and kith, land, and rule. Regarding the first field of comparison she employs a questioning anthropological approach that owes much to Leyser and Althoff, to distinguish between relatives (by blood or marriage) and friends or followers. Unfortunately, the subsequent analysis is not as structured and profound as it could have been: rather, it is a survey that does not study the dynamic of the dynasties in any depth and does not problematize the sources and their contexts enough. Moreover, there are some singular conceptualizations: regarding Adelheid, the definition of a spiritual family, based on the process of sanctification, that includes the bishop of Strasburg, Otto (1085–1100), and Pope Urban II (1088–1099), seems flawed. The description of Matilda’s relations is in many points questionable, too: there are purely hypothetical considerations (for example the relationship to her stepsister Ida of Boulogne), inaccuracies and simplifications such as those concerning Matilda's relations with Henry V "the countess lived in harmony with [him]", p. 35) or the popes ("serving seven [sic] popes with obedience and devotion", p. 5). In fact, there were tensions with many of them as well, as for instance the development of the relationship between the countess, Henry V and Paschalis II shows. Moreover, the representation of Matilda’s entourage as a political or philosophical salon of intellectuals and scholars is misleading: the links between the genesis and reception of the texts written by these scholarly clerics and Matilda are, on the other hand, rather neglected. Nash dedicates a little over 30 pages to the aspect "land". A brief introduction explains that in accordance with the explicitly didactic purpose of this book the crucial questions are those concerning dowry, inheritance and widowhood. Nash specifies them in the Italian context where queens and aristocratic women had a special role in the carriage of rulership. Nash sketches the acquisition of property in the case of Adelheid and elaborates on her concentration of lands in Burgundy and Alsace that would have contributed to the shift of the imperial route to Italy. Regarding Matilda Nash analyses three case studies that are not so obvious but rather associative: Melara (neighbouring landholdings of the two women), Hochfelden (transfer of an imperial landholding from Adelheid to a count by Empress Agnes) and Canossa. In this way Nash aims to show the shift of land and power to "the rising comital class" (p. 104), one of the paradigmatic processes of transformation of the eleventh century. The description remains, however, too short and superficial – the "comital class" is a generalization that does not grasp the complex stratification of the nobility – and some good comparative considerations in the section about law and property management are just hinted at. There, Matilda is compared with other contemporary non-royal aristocratic women (p. 118), according to a perspective that Elke Goez suggested a few years ago. And it is no coincidence that some brief comparisons of Adelheid with the empresses Theophano, Kunigunde and Agnes seem to be more meaningful than those with Matilda. The last and most extensive chapter deals with some aspects of the exercise of power elucidated in many maps. First Nash reviews characteristics of the Ottonian kingship to define the forms of involvement and the duties of the queens. Then Adelheid’s success as queen and her specific development of the model of queenship beyond the particular "Italian" pattern are examined: Nash points out her involvement in ruling next to the king and specifically analyses her interventions, titles and forms of representation. "Adelheid’s rulership legacy" would have been therefore "taken up by another woman, not a queen nor an empress but a countess, Matilda of Tuscany, in quite a different way" (p. 157). This connection is, however, not very clear and the subsequent comparative observations are rather obvious and unfortunately, sometimes wrong (for example: "The Canossans maintained their territories that were located northeast of the Apennines from Tuscany", p. 163). Nash elaborates on three aspects of Matilda´s rule comparatively: justice, violence/reconciliation and representation. To illustrate justice – meant in a broad sense as exercised authority and not judicial activity – she analyses the distribution of Matilda’s charters in space and time. The interesting evidence of the concentration of the documents between 1097 and 1115 needs a more complex political explanation than the simple consolidation of her rulership. Nash also tries to argue that Matilda wielded a real leadership in war, only reluctantly abandoning the idea of her direct participation on the battlefield. The last aspect treated by Nash – forms of representation – finally allows us to suggest a specific field in which this methodologically problematic comparison might have worked better: a systematic analysis of the appropriation of the qualities of queenship in the texts that were written by Matilda’s entourage. Another very promising but also specific field for such a comparative diachronic analysis could have been the exercise of justice in the strict sense: the role of Adelheid should have been compared "triangularly" with the role of Queen Matilda of England and Empress Richenza in Italy in the twelfth century who was influenced by the judicial practices of Matilda and her mother Beatrix. This interesting example of cross-dynastic adaptation of judicial practices refers lastly to a broader and fundamental problem of the long-term phenomenon of the construction of dynasties that have structurally produced a number of "masterful and formidable ladies": of various kinds. 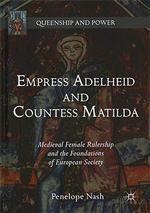 The intriguing but rather associative comparison of Adelheid and Matilda is not sufficient to enlighten either this problem or that of the transformations of the eleventh century because the two women were part of two very different social figurations that would need the mediation of more terms of comparison. It is not by chance that Nash must finally admit that the paradigm cannot be confirmed or confuted by the two case studies. Paul Veyne, L'inventaire des différences, Paris 1976. Elke Goez, Ein neuer Typ der europäischen Fürstin im 11. und frühen 12. Jahrhundert?, in: Bernd Schneidmüller / Stefan Weinfurter (Hrsg. ): Salisches Kaisertum und Neues Europa. Die Zeit Heinrichs IV. und Heinrichs V., Darmstadt 2007, pp. 161–193. Eugenio Riversi: Rezension zu: Nash, Penelope: Empress Adelheid and Countess Matilda. Medieval Female Rulership and the Foundations of European Society. New York 2017 , in: H-Soz-Kult, 14.03.2018, <www.hsozkult.de/publicationreview/id/rezbuecher-27882>.